Have you ever wanted to bundle yourself up in your favorite story? Carry it with you wherever you go? Do you consider literature to be a fashion statement? As a famous Stark would say, winter is coming, and now is the time for winter clothes! As a person who hates summer with a fiery passion, I am insanely excited for chilly weather. It dropped to 59 degrees yesterday morning and I ran out and bought a scarf because I was so happy. I should have waited, because today the internet gave to me the most awesome scarf in the entire world. It's a scarf that's a book! What can I say, I'm a target market. 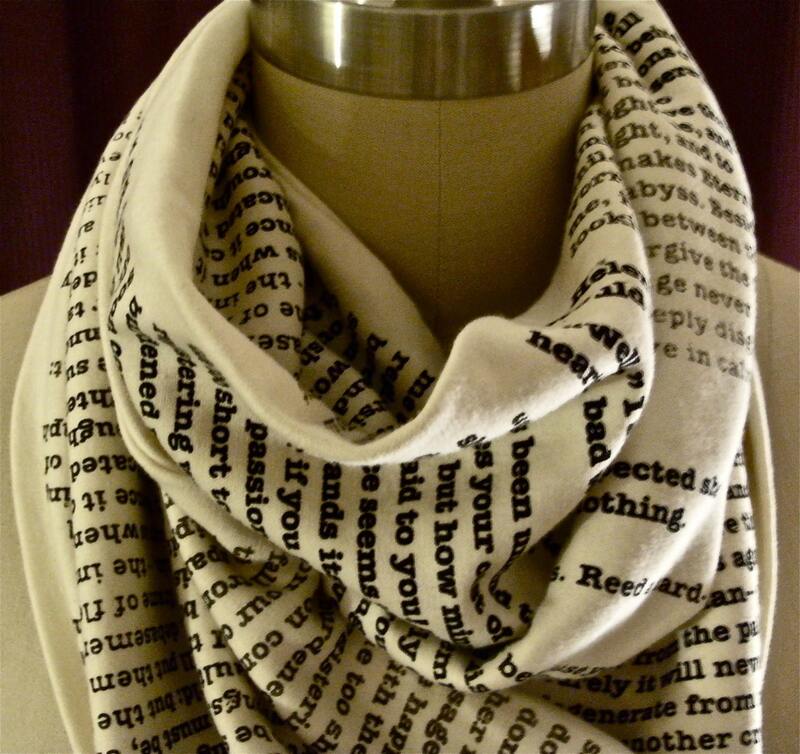 Etsy user Storiarts has created a trio of beautiful circle scarves imprinted with text from three different classic works of literature. Sure, they don't have Neil Gaiman poems or Lovecraft passages, but they're still nerdy as hell and beautiful to look at. Currently, there are three scarves; Persuasion by Jane Austen, Jane Eyre by Charlotte Bronte and A Tale of Two Cities by Charles Dickens. Each one is $39.99 and stunning to look at. They make quite a statement! A girl can have... lots of scarves, right? Guys, I could be wearing a BOOK. Don't stop me now! What? Why are you looking at me like that? Hm. I'd love these more if they were not circle scarves and if they had a more sff bent to the authors. But I do like the concept! 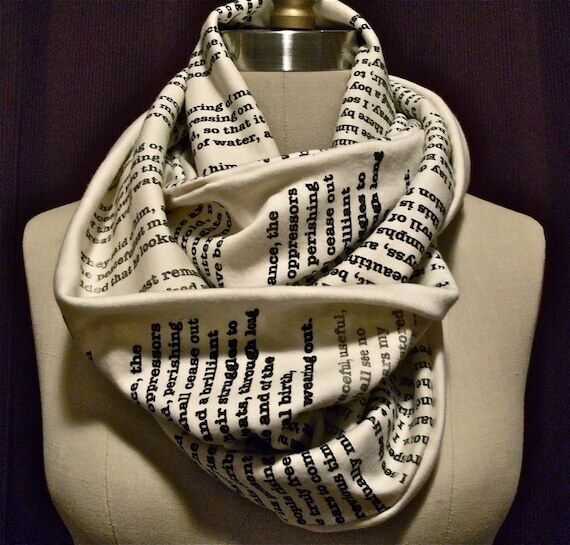 I must have the Jane Austen scarf. MUST.